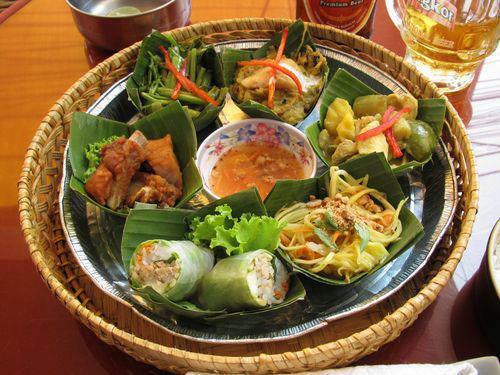 Khmer cuisine is one of the world’s oldest living cuisines and one of the most resilient on the planet. Spices are often exquisite in quality, yet restrained and understated in their use. Regional flavours and dishes prevail: cardamom from the Cardamom Mountains, turmeric from Battambang and of course Pepper from Kampot, these are internationally renowned for their intensity and quality. Saffron is valued for medical qualities as well as flavor and aroma. Tamarind also forms the basis of many sauces and marinades. An assortment of freshwater fish from the Tonle Sap, Mekong, Bassac; seafood from Kep and beyond are sought out and savoured. 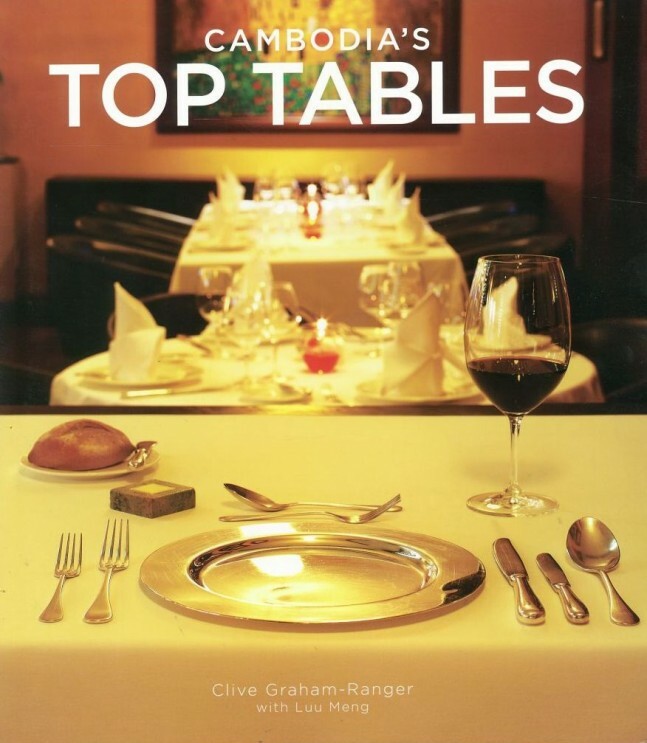 There are influences in the cuisine from China, (the Chinese began moving in Cambodian circles as far back as the thirteenth century), Vietnam and Thailand; as well as the impact of French colonialism on dish construction and cooking technique. Examples of these influences are available all across Cambodia in grilled meats, noodle dishes, bread and coffee. Chili was an unknown ingredient in Asia until introduced by the Portuguese in the sixteenth century; it is widely used in Khmer cuisine today although more sparingly than by many of its neighbours. 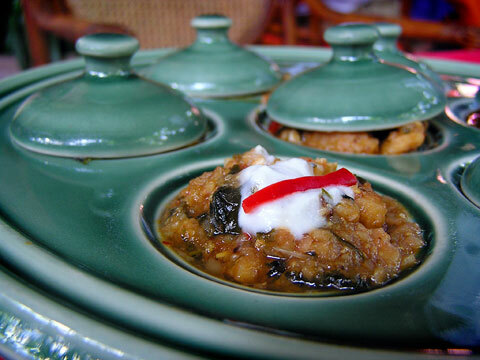 Prahok is a national culinary institution, a sauce/condiment/marinade made from fermented fish and used much in the same way westerners would use salt in cooking. Kroeung is a curry paste made from the skillful art of spice blending, introduced to Cambodia by the Javanese who were taught the skill by the Indians. Common ingredients in Kroeung are cardamom, star anise, clove, cinnamon, nutmeg, ginger, turmeric, lemongrass, galangal, garlic, shallots, cilantro and kaffir lime leaves. Rice is the stable and then the meal consists of a number of different dishes that individually highlight certain flavor components, (salty, sour, sweet, bitter, hot, umami) which, when combined as a single degustation, offer a sense of a complete and satisfactory meal. In tough times such as Khmer Rouge time, food was scarce, new and interesting proteins were introduced to the diet just to survive, (insects, rats, large spiders, etc). Fortunately, Khmer cuisine endured. In modern and more prosperous times great chef’s like Song Teng, (Cambodiana Hotel) have revived traditional Khmer cuisine and inspirational chef’s like Luu Meng, (Malis) are taking the cuisine forward, refining it and taking it to the world. International chefs are also discovering the joy of Cambodian ingredients, renowned French chef Johannes Riviere has become a devout disciple, opening his temple to Cambodian cuisine (Cuisine Wat Damnak) in Siem Reap whilst the irrepressible Neil Wager has been creating new masterpieces utilizing Cambodian ingredients for all the world to enjoy on Song Saa Island and former Song Saa Sous chef, the amazingly talented Tim Bruyns is about to open his new Phnom Penh restaurant, ‘The Common Tiger’ heavily inspired by his culinary explorations in Cambodia. 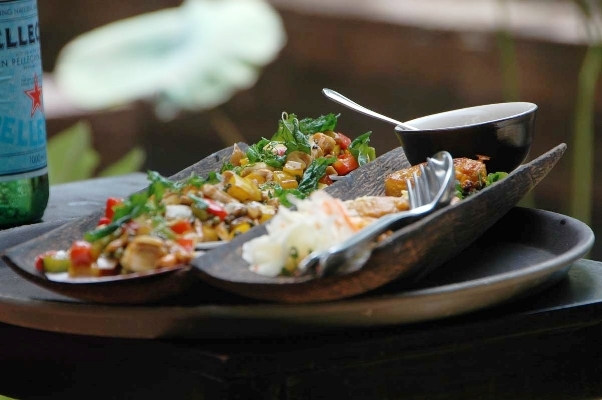 Pairing wine with Khmer cuisine can be fun and can bring a great deal of enjoyment and satisfaction although certain accepted norms must and can be successfully abandoned. For a start, it’s not going to work trying to pair a certain wine to a certain dish given that the meal usually consists of a selection of dishes that when eaten as a whole form the complete meal, less you want to have four of five glasses of wine in front of you all at once! So what we are looking for here are good all-rounders with the fresh clean flavours of Khmer food and subtle Asian spices. Aromatic whites of course shine with the fresh herbs, greens and spices abundant in Khmer dishes and the wide use of seafood and salads make then perfect partners: think Riesling, Sauvignon Blanc, Alberino, Pinot Grigio and you are on the right track. Rose also works well, particularly with the spicier dishes, look for the slightly off dry styles. If it has to be red then I adore Pinot Noir with Khmer cuisine although most fruity and fruit driven reds work well such as Merlot, Pinotage, Carmenere, Grenache, GSM (Grenache, Shiraz, Mourvedre) blends. For heavier red meat dishes I like Malbec from Argentina or juicy Aussie Shiraz. I personally find the main trick is to stay away from the big oaky whites and the big oaky and tannic reds instead, look for pure fruit driven wines to enhance your Cambodian culinary odyssey and enjoy.